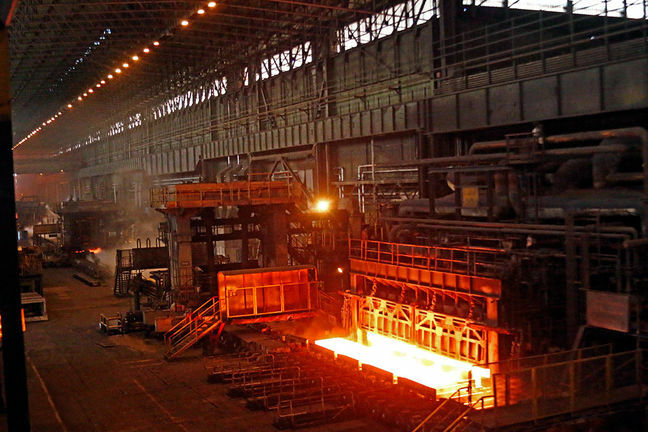 EghtesadOnline: Iranian steelmakers produced a total of 7.66 million tons of semi-finished and finished steel products during the first two months of the current fiscal year (started March 21), registering a 13% growth compared with last year’s corresponding period. Semis made up 4.25 million tons of the total figure, registering a 21% growth YOY. Billet and bloom output made up 2.23 million tons of the total figure while that of slab reached 2.02 million tons, recording a 30% and 12% year-on-year rise respectively. As for finished steel, output increased 5% YOY to reach 3.4 million tons, according to Financial Tribune. Hot-rolled coil had the lion’s share of finished steel production with 1.4 million tons, up 14% YOY. It was followed by rebar with 1.12 million tons, up 5%; cold-rolled coil with 360,000 tons, down 14%; coated coil with 207,000 tons, down 24%; beams with 173,000 tons, up 94%; and “other steel products” with 132,000 tons, down 14%. This year’s two-month performance shows a sharp break with last year’s dominant trend wherein all finished products registered growth in output, except for beams. Last year’s recession in the construction sector, which is arguably still continuing, has pushed most Iranian steelmakers such as Esfahan Steel Company away from long products and handed the market over to flat and semi producers and exporters such as Mobarakeh and Khuzestan steel companies. It remains to be seen whether the shift in output can translate to a significant movement in market demand, but with the reimposition of US sanctions on Iran on the horizon, steel exports might dwindle and local market could regain dominance. According to the US Treasury Department, sanctions on Iran’s sale, supply or trade of metals such as aluminum and steel, as well as graphite, coal and certain software for “integrating industrial processes” will return on August 6, i.e. after passing a 90-day mark since US President Donald Trump’s announcement on reinstating sanctions against Iran. Iran’s direct-reduced iron production is registering a healthy growth. It stood at 4.25 million tons during the two-month period of the current year, indicating a 29% rise YOY. According to World Steel Association, Iran has registered some of the highest month-on-month upticks in DRI output for the better part of 2018, surpassing its primary rival, India, in output growth. Despite the surge, however, the Islamic Republic is still the world’s second largest producer of the material. According to Industries Minister Mohammad Shariatmadari, more than 30 million tons of the target capacity has been realized.